Assessment Tests for N-Teach start today. If you registered for N-Teach and your BVN records match your application, please log in with your BVN and phone number to see when you are scheduled to write your assessment test. REMINDER: If you applied for N-Agro and N-Health between July 14th and July 27th, please log in with your BVN and phone number to write your assessment test. Please note that Npower applicants who applied after the 13th of July will write their assessment tests between 17th August – 31st August 2017. Just stay calm. Payment of June Stipends to some Npower beneficiaries was not successful because of unlinked BVN. Instructions on how to proceed has been sent to all affected. New Npower Assessment test will now commence August 9. N-Power Teach -> 2nd August – 16th August 2017. N-Power Tax -> July 15th – July 19th. N-Power Health -> July 20th – July 24th. The N-Power Graduate Programme for 2017 is now closed. 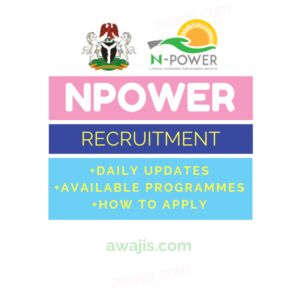 Application for 2017 N-power recruitment is ongoing. See details below. The Federal Government of Nigeria has flagged off the 2017 Npower recruitment exercise. They’re callling it the June July Batch. 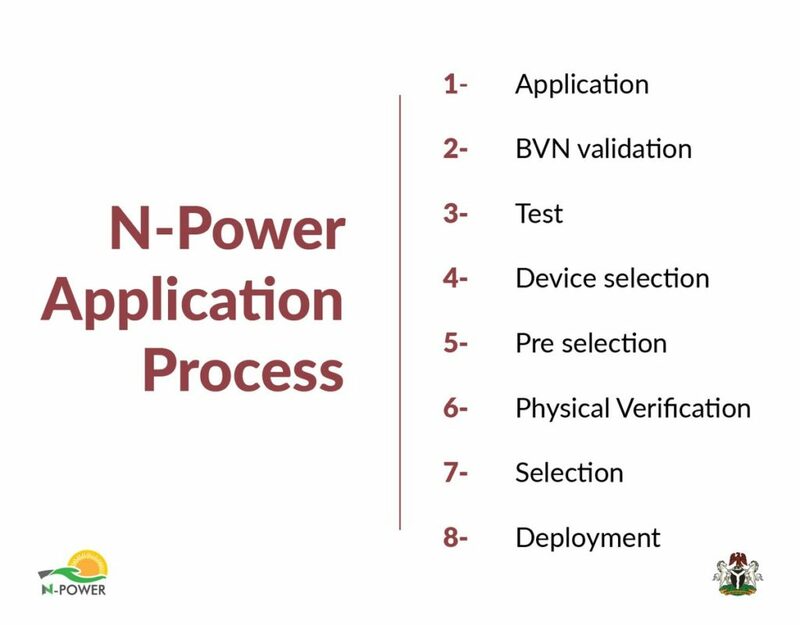 Here is all you need to know about the N-power registration et al. Here are 2 things you should know. This June July Npower Recruitment is only for graduates. This ongoing application(this one you’re reading) is not open to non graduate categories. You have to be within 18 – 35 years of age. Below is how your apply for the 2017 Npower job recruitment. step 3: Click on Apply. Then follow through on online procedures there. step 4: Once you’ve applied. Wait patiently for selection. You will be trained in the N-power volunteer Corp programme as Agriculture Extension Advisers. 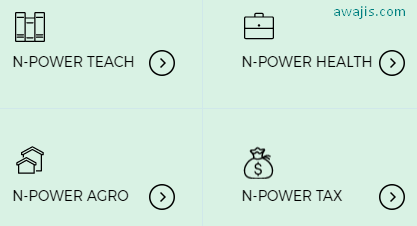 You (as an Npower Agro Volunteer) will engage in a 2-year Skill Acquisition programme while providing knowledge and science to our Farmers to boost production. You’ll a monthly stipend of N30,000 and a computing device to ensure your continous learning and advance on to better economic jobs. Summary is: Unemployed graduates are empowered for success while paving the way for an Effective and Knowledge based Agriculture system. The federal government trains you as an Health extension worker. Employees will engage in a 2-year skill development programme while promoting preventive health care among Pregnant women, Children and other vulnerable groups. You will receive a Monthly stipend of N30,000 and a computer device to ensure continuous learning and advancement to economic jobs. The summary is: Npower empowers you for success while paving the way for a responsive and efficient public health care system. You will be involved in a 2-year skill development programme while providing teaching support in public schools across Nigeria. You will receive a monthly salary of 30,000 naira and a computing device. The summary is: You, as an unemployed Nigerian Graduate are is empowered for success while you help improve the public school system in Nigeria. And you get paid too. It does sound cool. You will work as Community Tax Liaison Officers to work in your state of residence with the state’s tax authorities. The Federal Government wants encourage non-compliant and partially compliant taxpayers to come clean and declare and pay their appropriate tax due the government. A minimum of 3,700 N-Power volunteers will be selected to work as The N-Power community tax liaison officers. Your key responsibilities will include answering online inquiries, customer management, creating awareness of tax compliance. Same perks apply. About the 2016 Non Graduate Applications. Here is what N-power is saying. Selection for 2016 non Graduate is still on the way. Training and engagement of successful candidates is done in batches. What happen to our stipen payment of 20017-20018 candidate. Good day sir,pls when is the npowershortlisted current list will be out or ready? Thanks for the npower program. We are through with the 2017/2018 NPOWER exams, when will the list of successful candidates be out and when will work commence. Thanks.